Restaurant experiences can be all over the map. Sometimes, you’ll get over the top fancy-schmanzy. At other times, you will be lucky enough to snag a meal that tastes like it has been lovingly prepared in a family’s home kitchen. If you venture to Bordentown’s Under the Moon Café, the taste of home will resonate throughout the meal. Under the Moon Café was created by the mother and son team of Santiago and Estella Orosco, who came to the US by way of Buenos Aires, Argentina. They set out to create a warm atmosphere where they could serve quality, home-cooked meals. Think slowly simmered sauces that have been bubbly on the back of the stove all day. Or dream about a mile high lemon meringue pie with clouds of meringue dancing over a tart lemon filling. The restaurant has a quirky, antique shop look, with Singer sewing machine tables repurposed with glass tops and mismatched, yet carefully chosen chairs and teacups. An eclectic selection of music hums along in the background, with everything from New Age to South American pop. The restaurant serves a mix of both North American and South American dishes. I started with oozy baked brie that was topped with dried fruit, walnuts and a balsamic glaze. My sticky fingers provided evidence that I had enjoyed sopping up every last bit of the cheesy sweet goodness that this dish provided. Next up was a garden salad (complimentary with my entrée)-tasty, although it seemed to be lacking the sweet New Jersey tomatoes that are at their end of summer best. For the main course, I decided to try one of Mama Estella’s signature Argentinean recipes by sampling Mama’s Pork. It was a wonderful mélange of stuffed pork, bacon, plums and a sweet apricot glaze. This was home cooking at its finest-it tasted like it had been lovingly roasted in a friend’s home oven. Mashed sweet potatoes accompanied the pork dish. The sweet potatoes were creamy and cinnamon-flecked and were a perfect match for the pork. Sunday dinner at its best! When I learned that all of the desserts at Under the Moon Café were made from scratch, I knew that I had to make room. This turned out to be a good decision notwithstanding the (ahem) screaming waistband on my jeans. I ordered the luscious, rich and creamy Peanut Butter and Chocolate Pie, which had a decadent, yet homemade goodness. The nice people at Under the Moon also sent me home with a big brownie to try the next day. This was, without a doubt, the thickest, most chocolaty brownie that I have ever had in a restaurant. Here’s a tip: when you walk in to the restaurant, look to your right at the dessert case packed full of goodies, pre-plan your dessert attack, and make sure you save room! Both Santiago (Santi) and Estella were at the restaurant the night that I dined there. They have instilled a true spirit of hospitality in everyone who works for them. Both the chef and the servers checked in with guests to make sure that they were comfortable and were enjoying their meal. They also offered to make up a pitcher of Sangria for those that brought wine, a thoughtful touch. I spoke to several patrons who love the restaurant so much that they dine there weekly. It is a testament to the love and care that Santi and Estella have harnessed to create a restaurant with a winning menu and warm atmosphere. 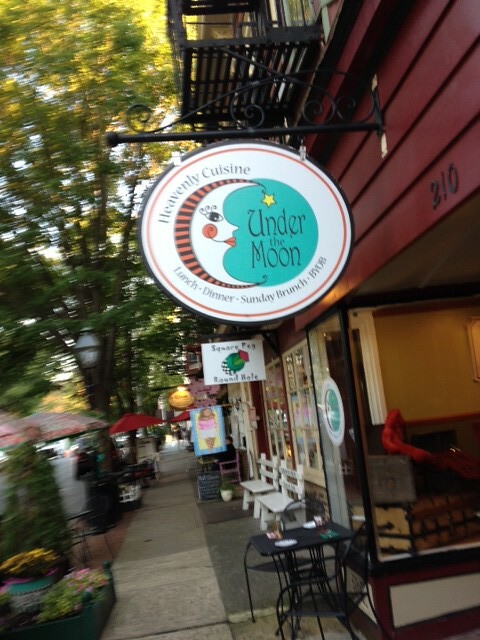 Under the Moon Café is located at 210 Farnsworth Avenue in Bordentown. Disclosure: I was invited to a dinner for female food bloggers at Under the Moon, but truth be told, I was planning on checking them out even before getting invited to that event.